The purpose of this online nomination survey is to help eligible Tibetan voters in North America to study and discuss their choice of two candidates for 2016 North America Chitue. The survey was first launched on June 23, 2015 and was open for eligible Tibetan voters until August 12, 2015. Participants were approached using Online Google Form as a survey tool to collect the data. Facebook groups such as Tibetan, IMTIBETAN, NY NJ Tibetan College Students, GTPN - North America and North America Tibetan Political Network were used to inform and reach a maximum of eligible Tibetan voters in North America. This online nomination survey carried only four questionnaire items: Who is your FIRST nominee for the North America Chitue? Who is your SECOND nominee for the North America Chitue? Where do you live now? and Are you eligible to vote? A total of 106 eligible voters participated in this online survey nomination. Of the total of 212 (106*2 Chitues) responses, 23 responses were marked "invalid" for two reasons: unidentifiable single names such as Kunga, Dorjee, Dawa, Tsering, Tenzin, none and lobsang; and invalid nominations such as Gari Dolma, Geshe Youngdung Gyaltsen, Lobsang Sangay, Tashi Wangdu and the survey administrator Tenzin Yeshi. Moreover, candidates receiving less than or equal to three counts of nomination were consolidated into "Others" which boils down to the 25% of total nominations. 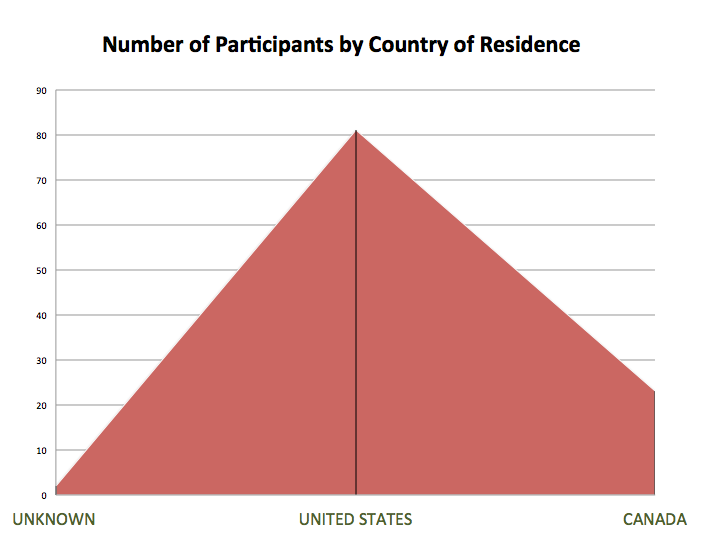 Of the total of 106 participants, 81 were from the United States, 23 from Canada and 2 remains Unknown. This majority of participants from the United States could be true if you look at the proportion of Tibetan immigrant population in these two countries; Tibetans in the United States could at least be three times the population of Tibetans in Canada. In this poll, there is no clear winner if you analyze by looking solely at the percentage of total nomination received. In figure 2 below, 60% of the total nominations were "Others", "Undecided" or "Invalid". However, if you disregard "Others", "Undecided" and "Invalid", you will get a different set of percentage. 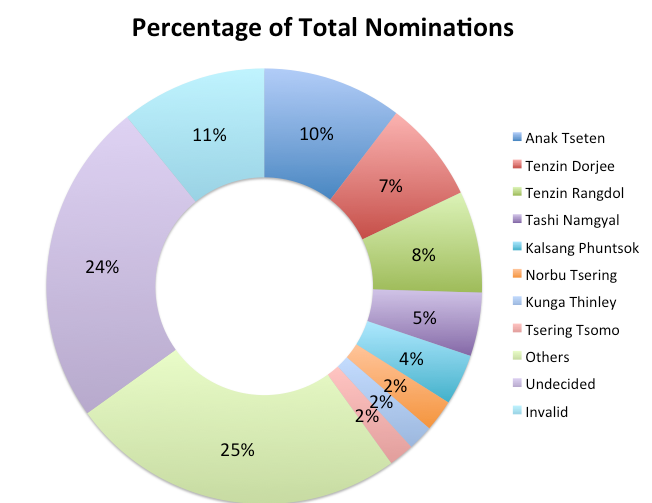 In the figure 3 below, Anak Tseten (26%) received the largest share of nominations followed by Tenzin Dorjee (19%), Tenzin Rangdol (19%) and Tashi Namgyal (12%). There were other four who received less than 10% of the nominations (excluding others, undecided and invalid): Kalsang Phuntsok with 9%, Norbu Tsering with 6%, Tsering Tsomo with 5% and Kunga Thinley with 4%. Participants have used different name spells. Anak Tseten was written as Anak Tseten, Anak Tsetan, Tsetan Anak, and Tseten Anak; Tenzin Dorjee as Tendor, Tenzing Dorjee ex-SFT President, Tenzing Dorji, Tenzin Dorjee and Tenzin Dorji (Tendor); Tenzin Rangdol as Tenzin Zrangdol, Tenzin Rangdol, Tenzin Randrol, and Rigdol or Rangdol (CA); Tashi Namgyal as Tashi Namgyal, Tashi Namgyal (chithu) and Tashi Namgyal la (Present NA Chitue). 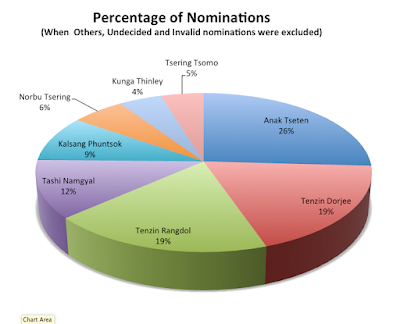 Of the four nominees receiving less than 10% of nominations, the most confusing was Kalsang Phuntsok. He was nominated as Kalsang Phuntsok, Kalsang Phuntsok former president of TYC, Kelsang Phuntsok - San Francisco, and Kelsang Phuntsok La (ExTYC President). And Tsering Tsomo was nominated as Tsering Tsomo, Tsering Tsomo ex president ctao/ex twa exec and Tsering Tsomo, Toronto. This online survey has many limitations including the lack of participation from eligible voters. The result generated from these 106 participants could be statistically insignificant. Looking at the findings of this online nomination survey, it helped to provide a good list of eligible candidates for 2016 North America Chitue. However, this does not mean that there are no other qualified candidates for 2016 North America Chitue. If you are qualified and interested, it is the time to declare your candidacy for the 2016 North America Chitue. The time is short. Since a close to 50% of this survey participants were either Undecided or nominated Others, the winners of 2016 North America Chitue's preliminary election could be anyone. Per the understanding of survey administrator, only Tenzin Rangdol from California has publicly announced his interest in running for the 2016 North America Chitue. However, the findings of this study may help many qualified candidates to publicly announce their interest in running for the 2016 North America Chitue. If any of the remaining seven nominees of this survey is interested in running for the 2016 North America Chitue, please send your short bio to the survey administrator by the end of August 2015 via tenyeshi@gmail.com. This will help the administrator to include your name in the Upcoming Online Opinion Poll on 2016 North America Chitue Preliminary Election.